As my first digital camera was a Ricoh, I have a very soft spot for them. This limited edition version of the GR Digital III looks amazing with its blue accents, and whaddya know, clothes-house Stussy helped design it. It's apparently the 30th birthday of Stussy, and to celebrate they've splashed it with a day-glo blue, though little else has changed. 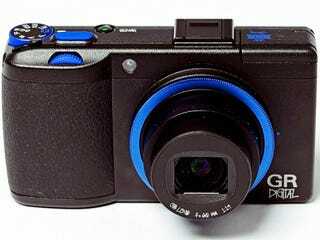 The GR Digital III went on sale in August this year, and has a 28mm/F1.9 lens, 10-megapixel 1/1.7-inch CCD sensor with 4x digital zoom and ISO of 64-1,600. It takes video, though only manages 640 x 480 at 15/30fps. On the outside, the LCD screen measures 3-inches, and there's an SD card slot for saving those valuable pics. The main attraction to this limited edition model is of course that day-glo blue, and the Stussy logo...though I can't imagine that being much of an incentive to anyone past 1995, if I'm honest.